Are you looking for driving lessons in Solihull? QDrive Driving School is a local driving school that serves the Solihull area. You may live or work in the Solihull area or go to school or college here. Whatever your circumstance we have local driving instructors who know the Solihull area well. QDrive Driving School also provides specialist Automatic driving lessons Solihull. Is it quicker to pass in an automatic car? Yes, on average a learner driver can pass an Automatic Driving Test faster than using a manual car. Many learner drivers opt for automatic driving lessons because it's simpler to operate as it has no clutch to worry about. An automatic car is easier and faster to learn in and less money is likely to be spent on driving lessons. Our local Driving Instructors in Solihull have a better understanding of the different types of roads and conditions you will face, giving you the opportunity to practice on the streets where you will be driving regularly. Some of the Shirley Driving Test Centre Routes around Solihull can be difficult. Choosing an instructor who has plenty of experience with the test routes around Solihull will help you to pass the test faster. With so many Driving Schools in Solihull to choose from, you can be sure that by choosing QDrive Driving School you will get the best value for money deals in Solihull and a dedicated Driving Instructor who will make your driving lessons informative and enjoyable in the same time. 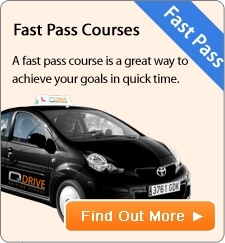 QDrive has fantastic offers for driving lessons in the Solihull area. Pass fast with our Intensive Driving Lessons in Solihull. We believe our Intensive Driving Courses are possibly the best value for money driving lessons available. Just imagine, you could have that desired driving licence within 5 days or a couple of weeks! Take a look at our Crash course prices and choose which would be suitable for you or your siblings. Based in Solihull QDrive Driving School offers fully structured courses consisting of Theory test support and practical test. Call us now to get the best value for money deals in the Solihull area.